Hair styling has become so interesting in today’s world with Frika hair boutique changing the face of hair styling by means of hair extension. Whether you are currently displeased with your hairstyle having repeated too many styles and short of what to do again, or your hair is just too short for ..
Hey girls! Trying to discover a new look? Bored of your hairdo, looking for something cool before you start college? 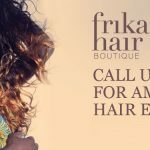 Trying to look fancy for a party or want to have an awesome hair do?Look no further, because we here at Frika Hair specialize in Hair Extensions changing, rearranging and maintain..